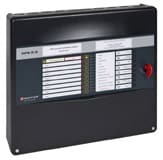 NFS eight zone conventional fire alarm panel, complete with fire and fault relay module and capacitor End of Line (EOL) for detector removal monitoring. NFS four zone conventional fire alarm panel, complete with fire and fault relay module and capacitor End of Line (EOL) for detector removal monitoring. NFS two zone conventional fire alarm panel, complete with fire and fault relay module and capacitor End of Line (EOL) for detector removal monitoring.